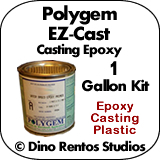 Polygem EZ-Cast - Casting Epoxy Plastic - Dino Rentos Studios, INC.
E-Z CAST is a 100% solids casting epoxy used to provide intricate detail and superior finish qualities for most casting projects. Cures into an extremely strong and durable plastic that is easily sanded or polished. Can be tinted or painted and accepts stains and washes. Solvent-free and won’t dissolve foam surfaces or shrink during its cure. A low viscosity liquid and has excellent air release properties for bubble-free castings. Ideal for small or large castings where strength and durability are desired. Available in a special Bone White color to provide for a realistic fossilized finish for bone castings. Pour the entire contents of Part B into the Part A container and slowly mix the contents for 3 minutes with a slow speed drill mixer. Avoid whipping air into the mixture and slowly pour the mixture into the mold.